In an Historic move Pope Francis said "anyone who does not recognize the Jewish people and the State of Israel — and their right to exist — is guilty of Antisemitism.” He also clarified what he said to Palestinian President Abbas. Pope Francis didn't say that Abbas is an angel of peace, the Pope gave a wish that he might become an angel of peace in the future. Pope Francis wrote these words in an email to Portuguese-Israeli Journalist Henrique Cymerman and Rabbi Avraham Skorka, two men that have had close relationships with the Pontiff, who approached the Pope after his recent meeting the Palestinian head where the Vatican recognized a Palestinian state. The pope recalled telling Abbas in Italian that he hopes the Palestinian chief might one day become an angel of peace in the future, according to Cymerman — although ostensibly he has not yet reached that level. The comments were sent by the Pope in writing to Cymerman along with Argentine Rabbi Abraham Skorka, one of Francis’s close interfaith colleagues, after the duo approached him following his meeting with Abbas, Channel 2 reported. Lombardi said that Francis often presents visiting leaders with the large round bronze medallion representing an angel of peace in order to encourage a commitment to peace. “When the pope presents the medal to the president or head of state, he offers a few words of explanation of the gift as well as an invitation to a commitment to peace on the part of the recipient,” Lombardi said. “Each one of us must be for others and for the world an ‘angel of peace.’” ” The word angel in this context, said Lombardi, means messenger. 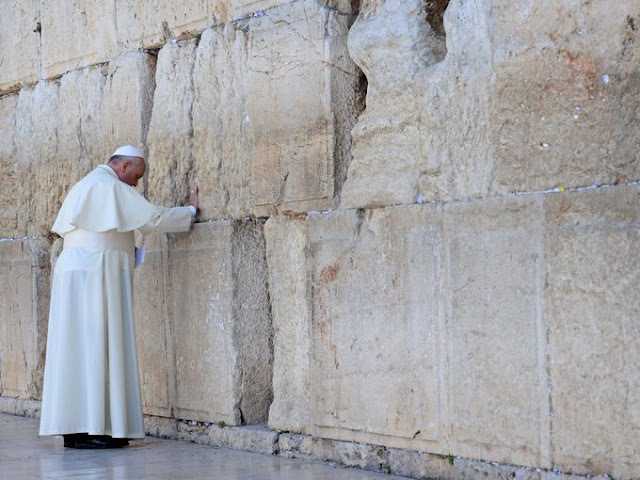 The Pope's statement is part of the growing tide of declarations from world leaders that belligerence toward Israel and denying that she has the right to exist as a Jewish State is an act of Antisemitism. While the Anti-Zionism=Antisemitism statements of those national leaders are crucially important, the declaration by the Pontiff is the first recognition by a world-wide religious leader that you can’t align against the rights and moral aspirations of the Jewish people and claim to be shocked when you’re accused of Antisemitism.